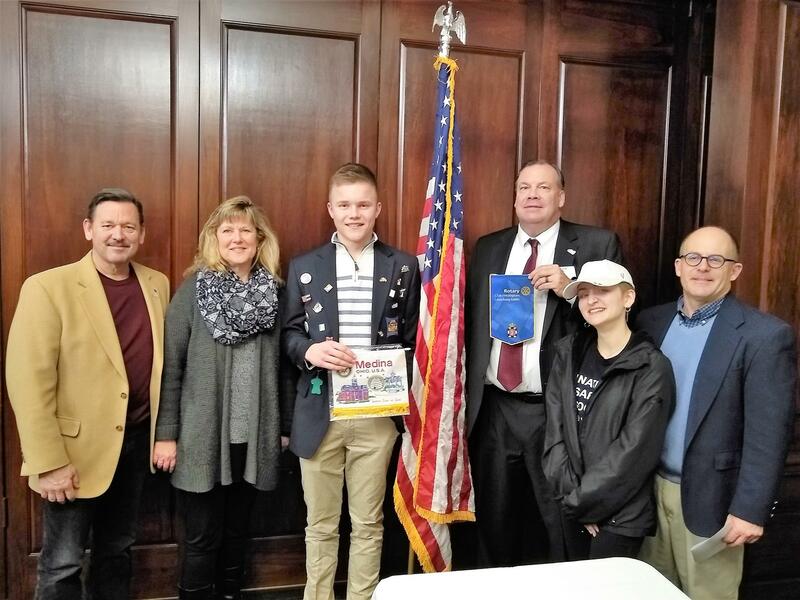 Medina Rotary gave a warm welcome to Jacob Scharnweber, Medina High School's new Rotary Youth Exchange Student from Molln, Germany. Jacob, who arrived in August, is enrolled as a Junior. He is an Honor Student and lettered in golf. He is currently training in soccer and tennis, and is enjoying his new friends at Medina High School and his two host families, David & Beth Vogelgesang and John & Susan Watkins. Rotary Youth Exchange (RYE) is a Rotary International student exchange scholarship program for students in secondary school. Since 1929, Rotary International has sent highly qualified young people around the globe to experience new cultures and be youth ambassadors of their local communities. Currently, about 8,000 students are sponsored by Rotary clubs every year. Rotary is a fully accredited member of CSIET - Council of Standards for International Student Exchange: http://www.csiet.org.